Indonesia's foreign policy is often confusing when the country is supposed to act and conduct a diplomacy that is accurate and correct in putting in order its relations with Asean. When China created some disorder with its agreement on the South China Sea with four Asean members (China, Brunei, Laos and Cambodia), Indonesia's Foreign Ministry kept silent and did not raise the issue of intervention in Asean's problems. But when Singapore imposed its Transboundary Haze Pollution Act that was legislated by the Singapore Parliament in 2014, the Foreign Ministry reacted last week by stating its reservations with the law, saying that the law would create a loss in trade for both sides. Intervention in foreign countries' laws are easily commented on as "causing a loss to Indonesian companies". 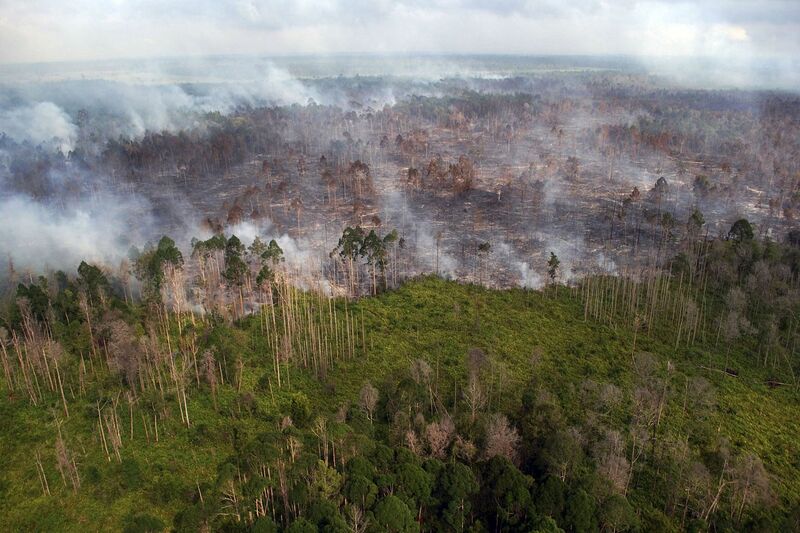 This intervention by Indonesia was done after Singapore's NEA (National Environment Agency) issued an arrest warrant for the director of an Indonesian company relating to the mitigation measures the company took over forest burning in Indonesia last year, which caused prolonged pollution and suffering to the people of Malaysia and Singapore. Unilaterally, Environment and Forestry Minister Siti Nurbaya Bakar told foresthints.news that Indonesia is looking at all plans and cooperation in the future related to environment and forestry with Singapore. In fact, a cooperation agreement related to forest burning and haze which was under way was suspended. Indonesia must reconsider the environmental diplomacy position it wants to take, and not be protective in the name of sovereignty, a reflection of its inability to cooperate to resolve forest logging. I feel that Indonesia does not have the means to carry out environmental diplomacy as a commitment to reduce greenhouse gas emissions and simply offers proposals and promises. Indonesia was the first developing country that said it would reduce carbon dioxide emissions by 26 per cent in 2009 and will reach 41 per cent in 2020 with international assistance. President Joko Widodo, at the COP21 (Conference of Parties) on Climate Change Summit in Paris, said that Indonesia is part of the solution that provides political support for the COP21. First, we easily shelter behind "sovereignty" when there are sanctions or legal threats against business owners who carry out unscrupulous practices such as forest logging. A new law to punish polluters who cause the haze was passed in the Singapore Parliament in August 2014. It is targeted at firms that cause fires overseas, leading to haze here. •Companies will be fined for each day that they contribute to "unhealthy" haze. Unhealthy haze is defined in the new law as air quality having a Pollutant Standards Index (PSI) value of 101 or greater for 24 hours or more. •Polluting companies may be fined up to $100,000 a day, up to a maximum of $2 million. •The law also lets people or companies sue polluters, with no limit set on the amount of damages they can ask for. This legislation marks Singapore's first legal move against polluters, but enforcement might be difficult as large palm oil companies based in Indonesia are the main contributors to transboundary haze in Singapore and it would be difficult to nab firms based outside Singapore without infringing on the sovereignty of another country. During the parliamentary debate, MPs asked how the law would be enforced, especially if companies are based overseas. Representatives of the firms responsible for the haze can be served notices when they are in Singapore, replied then Environment and Water Resources Minister Vivian Balakrishnan. He added that the National Environment Agency (NEA) would work closely with the Immigration and Checkpoints Authority to do so. And the Public Prosecutor can apply for a court order to require them to remain in Singapore to assist in investigations. Dr Balakrishnan said at the time that the new law is not meant to replace enforcement that should be taken by other countries. "It is to complement their investigative and enforcement efforts," he said. In September and October last year, forest and peatland fires in Indonesia, widely believed to be caused by errant pulp and paper companies, resulted in haze conditions in Singapore. Since then, the NEA has given notices to six of these Indonesia-based firms, asking them to explain the steps taken to put out and prevent fires on their land. Two firms replied. In May, the NEA obtained a court order against the director of one of the other four companies. He had been served a notice to give information about his firm's move to mitigate fires on its land and prevent a repeat of last year's haze, but failed to turn up at the interview. With the court warrant issued, the director may be detained if he tries to enter Singapore again. Second, environmental diplomacy is part of the overall process of mediation that unifies the diversity in actions and views of certain universal environmental norms and local environmental values. The issue of the environment has a transnational characteristic and it requires various solutions, norms and even joint schemes to overcome it, including with Singapore. In this context, we must transcend the issue of "sovereignty" because the issue of environment, especially related to forest logging that causes prolonged haze, must be immediately and comprehensively tackled. This includes imposing of sanctions on errant companies. Indonesia must reconsider the environmental diplomacy position it wants to take, and not be protective in the name of sovereignty, a reflection of its inability to cooperate to resolve forest logging. Singapore's NEA issued a reminder to six companies. It is about time the companies are examined too in Indonesia. Indonesia's environmental diplomacy strategy must be capable of balancing a variety of dynamic interests in the Asean environment. There are many environmental issues that need to be resolved so that there is political support for President Joko on the reduction of global carbon emissions. •This article first appeared in the Indonesian newspaper Kompas.